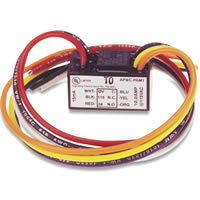 The SSU-PAM-SD Relay provides 7.0 Amp Form C contacts. 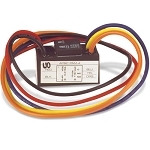 The relay may be energized by an input voltage between 20VDC to 32VDC, making it ideal for 24VDC NAC circuits. The input voltages are polarity sensitive and diode protected. 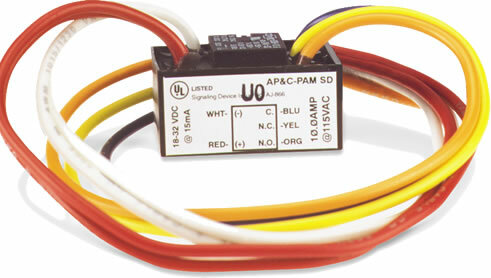 The PAM-SD provides an additional set of wires for redundant input voltage (Class "A" circuit supervision pass through). The PAM Series Relays are encapsulated multi-voltage devices with "flying" leads that offer versatile, reliable performance in a convenient package. They are packaged with a self-tapping screw and a piece of double sided tape for easy installation almost anywhere. The relays are also packaged with wire-nuts to aid installation. 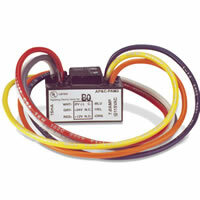 PAM Relays are ideal for applications where remote relays are required for control or status feedback. They are suitable for use with HVAC, temperature control, ire alarm, security, energy management, lighting control systems and building automation systems. (1) SPDT Dry Form "C"
Pre-drilled mounting screw hole and self-tapping screw provided. Double sided tape also provided. The SSU-PAM-SD Relay provides 7.0 Amp Form C contacts. The relay may be energized by an input voltage between 18VDC to 32VDC, making it ideal for 24VDC NAC circuits.